Trees , to 46 m. Bark light gray, fissured or exfoliating, separating freely into long strips or broad plates that persist, ends often curling away from trunk. Twigs greenish, reddish, or orangish brown, retaining color or turning black on drying, stout or slender, hirsute or glabrous. 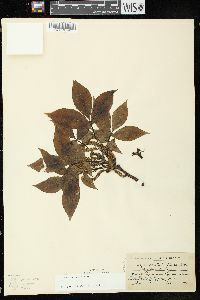 Terminal buds tan to dark brown to black, ovoid, 6-18 mm, tomentose or nearly glabrous; bud scales imbricate; axillary buds protected by bracteoles fused into hood. 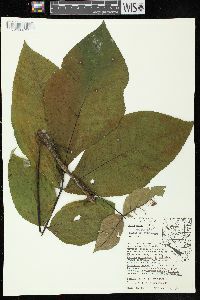 Leaves 3-6 dm; petiole 4-13 cm, petiole and rachis hirsute or mainly glabrous. Leaflets (3-)5(-7), lateral petiolules 0-1 mm, terminal petiolules 3-17 mm; blades ovate, obovate, or elliptic, not falcate, 4-26 × 1-14 cm, margins finely to coarsely serrate, with tufts of hairs in axils of proximal veins of serrations, often weathering to only a few in fall, apex acute to acuminate; surfaces abaxially hirsute with unicellular and 2-4-rayed fasciculate hairs, occasionally restricted to midrib and major veins or essentially without hairs, with few to many large peltate scales and small round, irregular, and 4-lobed peltate scales. Staminate catkins pedunculate, to 13 cm, stalks and bracts without hairs; anthers hirsute. Fruits brown to reddish brown, spheric to depressed-spheric, not compressed, 2.5-4 × 2.5-4 cm; husks rough, 4-15 mm thick, dehiscing to base, sutures smooth; nuts tan, ovoid, obovoid, or ellipsoid, compressed, 4-angled, rugulose; shells thick. Seeds sweet. Native Americans used Carya ovata medicinally as an antirheumatic, a gynecological aid, a tonic, and an anthelmintic (D. E. Moerman 1986). Carya ovata hybridizes with C . cordiformis ( C . × laneyi Sargent), C . illinoinensis , and C . laciniosa ( C . × dunbarii Sargent). The Mexican shagbark appears to be a good variety. The Mexican hickory ( Carya ovata var. mexicana (Hemsley) W. E. Manning) appears to be synonymous with C . ovata . 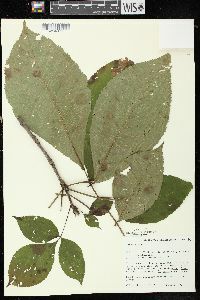 Tree 18 - 25 m tall, trunk 30 cm - 0.8 m in diameter Leaves: alternate, odd-pinnately compound, 20 - 36 cm long, with five leaflets. Flowers: either male or female, found on the same tree (monoecious), male flowers in clusters of three catkins 10 - 13 cm long, female flowers in short spikes of two to five. Fruit: a nut surrounded by a husk, 2 - 4 cm long, often slightly wider than long. The husk is brown to reddish brown and nearly spherical, and the nut is tan and four-ribbed. Bark: gray and smooth when young, developing shaggy strips that curl away from one or both ends. Twigs: green to dark reddish brown and slightly hairy, becoming gray and smooth. Terminal buds: 1.3 - 2 cm long, egg-shaped, with dark brown outer scales peeling slightly to reveal hairy inner scales. Leaflets: dark yellowish green above, paler beneath, 10 - 15 cm long, 1.3 - 7 cm wide, terminal leaflet largest, narrow oblong or elliptic, finely toothed with tiny tufts of white hairs along margins. Leaves turn golden in fall. Foliage releases an apple-like aroma when crushed. Similar species: Carya cordiformis can be distinguished from other hickories by its sulfur-yellow buds that appear naked, nine narrow leaflets, fruit with a husk that splits to the middle, and bark that remains tight. 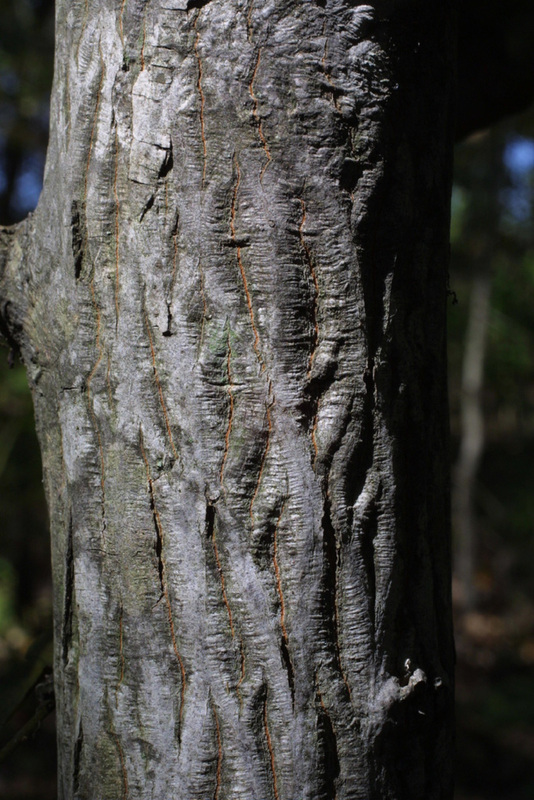 Carya glabra has bark that remains tight except for a few shaggy strips, fairly smooth twigs, five to seven leaflets, pear-shaped to elliptical or spherical fruit with a husk that may split to the base, and small dome-shaped terminal buds. Carya laciniosa dffers by its shaggy bark, stout orangish tan twigs with orange lenticels, seven leaflets with soft hairs beneath, very large oblong to spherical and four- to six-ridged nuts with husks splitting to the base, and large terminal buds with slightly curling outer scales. 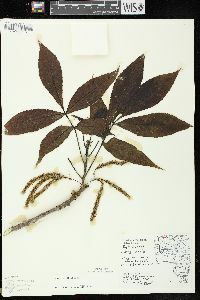 Carya tomentosa has fissured bark, densely hairy and reddish brown twigs, seven to nine leaflets with hairs beneath, and husks that split to the middle or base to reveal four-ridged nuts. Habitat and ecology: A very common species in savannas and glacial morainic hills. Carya ovata is also found along the edges of sedge meadows and wet prairies, and in upland, mesophytic, disturbed, and low woods. Notes: Andrew Jackson was named "Old Hickory" after this species, as the tree is considered a symbol of strength. The nuts are sold commercially and the wood is commonly used to smoke meat. Etymology: Carya comes from the Greek name for walnut. Ovata comes from the Latin word meaning egg-shaped. Infrequent to common in every county of the state. Its habitat is moist, rich woodland but it is sometimes found on slopes of hills. It is usually associated with red oak, bigleaf shagbark hickory, swamp white oak, basswood, white ash, slippery elm, sugar maple, beech, and sweet gum. [Variety fraxinifolia] is described as "having leaflets lanceolate to slightly oblanceolate, acuminate, thick and firm in texture, lustrous above, pubescent along the midribs below, the terminal 1.4-1.5 dm long, from 4.4-5 cm wide, and raised on a slender puberulous petiolule, the lateral leaflets asymmetric at the base, sessile, those of the lowest pair 7-9 cm long, and 2.5-3 cm wide." 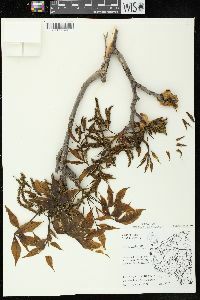 Sargent referred specimens which I had collected from Daviess, Martin, and Wells Counties to this variety. [Variety nuttalli] is described as having "nut rounded, obcordate or rarely pointed at apex, rounded or abruptly pointed at the base, much compressed, prominently angled, about 1.5 cm long, and 1-1.2 cm thick; involucre 4-10 mm thick and splitting freely to the base. Except in size of the fruit there appears to be no character by which the variety can be distinguished from the common Shagbark." 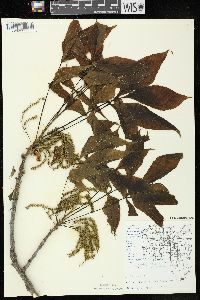 Bark light gray, soon separating into long plates; twigs stout, with a large gray bud; lfls 5, or 7 on sprouts, pubescent beneath when young, soon glabrate except for subapical tufts of hairs on the teeth, the terminal obovate, much larger and proportionately wider than the lateral; fr subglobose to broadly obovoid, mostly 3.5-5 cm; husk 3-12 mm thick, eventually splitting to the base; nut compressed, 2-3 cm, two-thirds as wide or wider, rounded at base, usually sharp-pointed; kernel sweet and edible; 2n=32. Rich, moist soil; s. Me. and s. Que. to se. Minn. and w. Neb., s. to Ga. and e. Tex.